Larne Tech’s Clarence Cup run continues after Saturday’s penalty shootout success over Abbey Villa. The men from Millisle may be five places and seven points ahead of Johnny Hastings’ side in Division 1A, but it was the Tech who got the better of them in this fourth-round tie. It was scoreless until extra-time when Villa took the lead with a deflected shot off Martin Steele before Neil Webb levelled. So to spot-kicks, and Keith Wilson saved one while Villa missed another. Steele, Webb, and Reece McGinley found the net before Peter Wilkinson converted the winner. Premier Division: After back-to-back draws, Islandmagee slumped to a 4-1 defeat at Drumaness Mills. Darren McConnell put the home side in front when he headed home, before Stefan Mason doubled their advantage. The Islanders pulled a goal back when Andy Phillips’s header beat the keeper at a corner. But Drumaness made sure of all three points when Adam Neale found the net with five minutes to go. And it was that man Neale who put the gloss on what was his side’s win with the fourth. 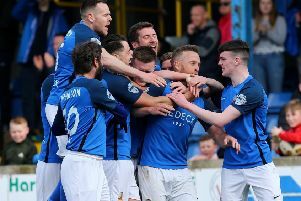 It’s just one victory in the last 12 for Nortel after a 5-0 defeat to title favourites Ards Rangers at the Factory Grounds. A Ricky Rutherford hat-trick and goals from Gary McDermott and Glen Upton made it a comfortable afternoon for the Drome Park outfit. Next up for Lee McCartney’s Nortel is a trip to Drumaness Mills on Saturday. Division 1A: Padraig Scollay scored UUJ’s only goal in Saturday’s 2-1 defeat at home to Rosario. The students, who squandered and string of chances against the south Belfast outfit, remain second-bottom in the table. Division 1B: Bill Campbell’s Rathfern Rangers had day to forget, slumping to an 8-2 defeat at Ballywalter Rec. The result was a far cry from when Rangers claimed three points in a 2-1 win against the Davidson Park side earlier this season. Rathfern will be aiming to bounce back this weekend when Campbell takes his side on the short trip to the Shore Road to face his old team, Grove United who were on the wrong end of a 2-1 defeat to Wellington Rec on Saturday. Lee Rea and Craig Cowie scored for Wellington.